Warm Paw played Keane on repeat. Why hasn’t the mellow Britrock scene all slit their wrists and died an automatic death? The answer is simple. They are all manufactured… robots! Remember Gorillaz? If these songs were written by humans, they wouldn’t have kept a blade away to last a whole album’s worth. You guys should’ve seen it coming with William Hung. He’s the man. He’s the engineer. He engineers. He’s not the best engineer, especially when it comes to the biomechanical facial skeletal expressions of Chris Martin and Thom Yorke. He could very well be creating Britrocking robots, perpetuating a strong sense of low self-esteem in the oodles of self-righteous “this is real muse-ic” fans. Think MUSE. Even Coldplay hinted at their robotic true self in their videos (plus their monotonous rhythm reinforces that). The Americans are real rebels, though. They are angry! Do upon others harm; it is better than doing upon yourself harm. Which is really what I think I should be doing. This entry was posted in Jokes, Music on June 30, 2004 by 2konbla. This entry was posted in Geek, Music, Pictures, Toys, Travelling on June 28, 2004 by 2konbla. Gee, I don’t delete friends with strange nicks (can’t you read my email, even if it is backwards?) I don’t know if people who change nicks all the time get deleted either. I thought nick-changing was commonplace, especially to lyrics. If it’s not lyrics then it’s some gothic depression expression. Oh, right. I’m supposed to add my old nick to it, but that would spoil the reversed cuteness of having a nick like reebtoow dna sregrubma now wouldn’t it? This entry was posted in General on June 25, 2004 by 2konbla. No wonder the chords to Cast A Shade were familiar; the first three are very much like the verse chords to Stone Temple Pilots – Plush! He too took a descending chromatic line (D to B) and used chords around them. I swear I was not inspired by Plush; I was inspired by Led Zeppelin – Stairway To Heaven and Kashmir. Stairway To Heaven’s intro riff for one has a descending chromatic bassline. Very neat. Of course, there are other lesser-known inverted chord mathemagicians, but I shall only proclaim my love for those who made their alternate-voiced chords on radio, like um Stone Temple Pilots, The Who, Led Zeppelin, Incubus and um Eric Clapton to some extent. This entry was posted in Music on June 24, 2004 by 2konbla. Now usually what I do is scoff it off as a doctored fake, but today I took the time to cut 4:20 to 4:40 of the song and reverse it in Cool Edit Pro 2. It sounded like the Flash file, but clearer! Hey, if you call me and I don’t pick up, you get to hear a reversed message too. Had it quite a while though. Very cool since I sounded German there. This entry was posted in Music on June 22, 2004 by 2konbla. 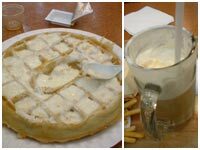 Shaz, Alex and I were at A&W Drive In, PJ for our own ice-creamed waffle escapade. I forgot to whip out my digicam for this round (Alex took pictures though). It was good minus the fact that I did not get my cheese! Sorry for the badly lit picture of the receipt. This entry was posted in General, Jokes, Pictures, Travelling on June 21, 2004 by 2konbla. Bintang Walk, and a few roads off it, had its busiest Monday, and it was not a public holiday. The cause of traffic jams that was of no consequence to me? HELP Institute’s Fete De La Musique 2004. This shall be an exercise in linking as much as I can, perhaps in parody of link-everything-overinformatively blogs and websites with too many sponsored links. 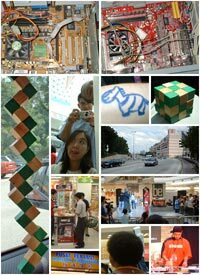 I headed there with digicam, printed schedule and map, to Berjaya Times Square first, bumping into Alda and the rest of Dragon Red, including extended family members like Debbie. Syefri was there too, awaiting his turn to not follow schedule. I headed to Sungei Wang to meet up with Hanna and Carolyn. There wasn’t much there after the Dancing Queens, and so our legs took us through air-conditioned conditions to BB Plaza and then Lot 10 and KL Plaza, bumping into KJ the retired porcupine hair bearer. KL Plaza held no promise, as we headed down Star Hill lane to lead up to Music Exchange. Despite its “Closed Mondays” sign, Hanna left with 7 CDs. This entry was posted in Music, Pictures, Travelling on June 21, 2004 by 2konbla. Ah well, no use slitting wrists over that, I said, and walked over to A&W KLCC. I ordered a coney dog combo with root beer float, and a waffle with butter and syrup. I put the tray on the table and went to the sink to wash my hands. As I walked back, they brought a waffle with icecream and strawberry syrup! As they left, I realized that my tray already had butter and syrup. Damn, wasted a chance to have free icecream and strawberry syrup. Notice on the right that there was more than enough leftover float. 🙂 Yes that is how I eat my waffles uh-hyuk. This entry was posted in General, Pictures on June 17, 2004 by 2konbla. This was cause for further investigation, and so we went down. I diagrammatically showed the processes I learnt from manuals for anything beyond the first layer (as opposed to being completely self-taught!) All she did was wave her hands in the air. 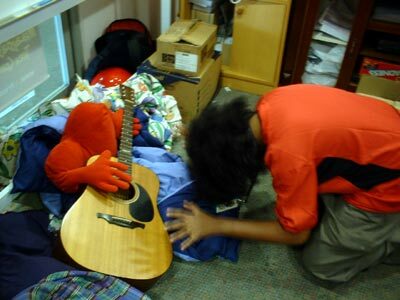 After the jam was over, we all bummed around a bit, with me wishing I bothered with the voice recorder. Hung around a bit too long we did, to the ire of those waiting for us. I’d think it was least to my fault, but alas, his account was that a chick came and I led myself away. “But she was like saying Rubik’s Cubes and I wanted to get free tickets“… and that was like kapow Zoltan! etcetera. I swear upon all my excuses before that it was true. I now carry a cube with me in my bag at all times. This entry was posted in Jokes, Music on June 14, 2004 by 2konbla. 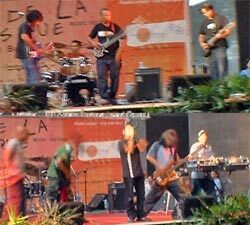 Once, there was a bassist named Syefri, who could not count time or read notes. He could not frag well either. This entry was posted in Jokes, Pictures on June 11, 2004 by 2konbla.